It’s often thought that AFL is a more marketable game than its NRL rival because of its ability to attract female fans. And according to research released today by Roy Morgan that arguably rings true. The research firm has examined the fan base of the two teams in Saturday’s AFL grand final and found that 58.4 per cent of Sydney supporters are men and 41.6 per cent are women. However when it comes to gender diversity over at the Western Bulldogs it’s almost an even split – 50.1 per cent are women and 49.9 per cent are men. The average age of a Swans fan is 47 and for the Bulldogs its a more youthful 44. That said, the Bulldogs had more fans in the over-65 bracket who are old enough to remember the team’s last flag in 1954. Commenting on the findings, Roy Morgan’s industry communications director, Norman Morris, said: “As another AFL Grand Final rolls around, so too does Roy Morgan’s annual comparison of each team’s supporters. Unlike some years, when both groups of fans share many similarities, Bulldogs and Swans fans are noticeably different. “One key difference is how much more involved Bulldogs supporters are with AFL, being over three times more likely than Sydney supporters to be financial members of their club, as well as showing greater inclination to attend matches and watch them on TV. Considering their team hasn’t been in a Grand Final for 55 years, this makes sense—you’ve got to be very committed to stick it out with a perpetual underdog! “The different political attitudes of each team’s fans is also noteworthy. 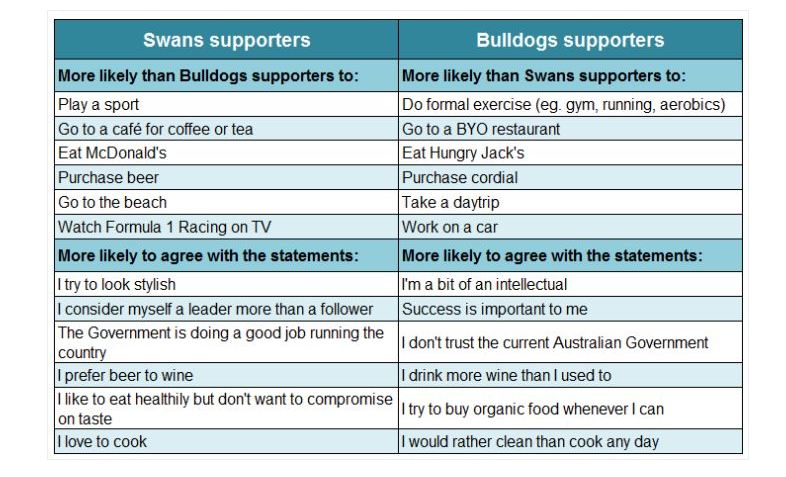 Swans supporters are more likely than their Bulldogs counterparts (not to mention the average Australian) to believe the ‘Government is doing a good job running the country’: which is good news for Prime Minister Malcolm Turnbull, who recently declared his support of the team at a UN conference in New York, no less! “Bulldogs fans, on the other hand, are more likely than Swans supporters (and the average Aussie) to say they ‘don’t trust the current Australian Government’…which would probably please former PM Julia Gillard, one of the team’s highest-profile fans,” he said.